Today was the team’s final day in Pearland. 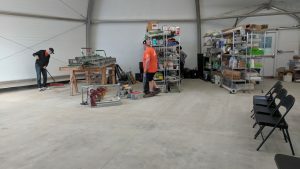 We stayed back at basecamp to assist in cleaning and preparing the Sprung building, SP’s storage building, for a special event next week. 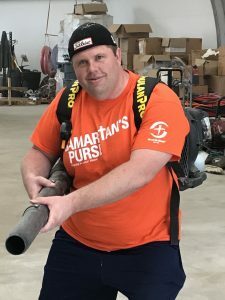 Similar to the training volunteers get each week, Samaritan’s Purse will be training the local contractors they work with as well as sharing the gospel. 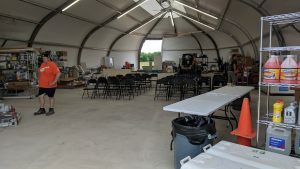 This will be the first time SP has done this type of training, at least in Texas. Please be praying for hearts to be open and continued partnerships with these contractors. Their work greatly aids in the rebuilding process. Team Carl was able to say a final goodbye to Adrienne and her family. Scott worked hard to get John cheering for the Packers (in addition to the Saints). Her home will be finished early next week as they finalize plumbing and electrical. Praise God! The team had a final lunch together with Jerry, Team Carla’s construction lead, before hitting the road midday. 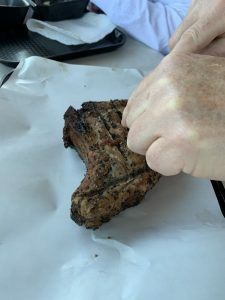 We stopped for some more delicous Texas BBQ at Naaman’s. Even Dan was singing its praises between bites of his delicious pork chops. We’ve landed for the night in our hotel and we’ll have an early start tomorrow as we drive the last (long) leg home. Please pray for mild weather and smooth roads as we make our way home tomorrow. Thank you to those who have supported us through prayer and to those following our time in Texas through the blog. Thank you to Blackhawk’s Impact staff for their hard work in preparing this trip and providing structure and support. And a big thank you to our spouses – Janet, Kirsten, Kate, Melissa, Bob, and Jake – and our families. We are so appreciative of your encouragement and support to make this trip a reality. We could not be doing this without you! This entry was posted in Uncategorized by srussell. Bookmark the permalink. Great work all! It’s many people doing a small part that make a difference in this world. Thanks for making a diffenerence in all of these peoples lives. Prayers for safe travels. Brad, you look like the present day ghostbuster! Did you catch Slimer? Come home safely to us everyone! Can’t wait to see you all and hear how God has been working this week.